The thunderstorms cleared just in time for race 3 of the season on Sunday – the Cradle Coast Sports and Events 7km handicap at Don. The race was run in perfect running conditions – light drizzle with no wind – although the track was very wet underfoot. This all suited Burnie runner Mary-Lou Troughton, who was delighted to break through for her first win in her three seasons with the club. 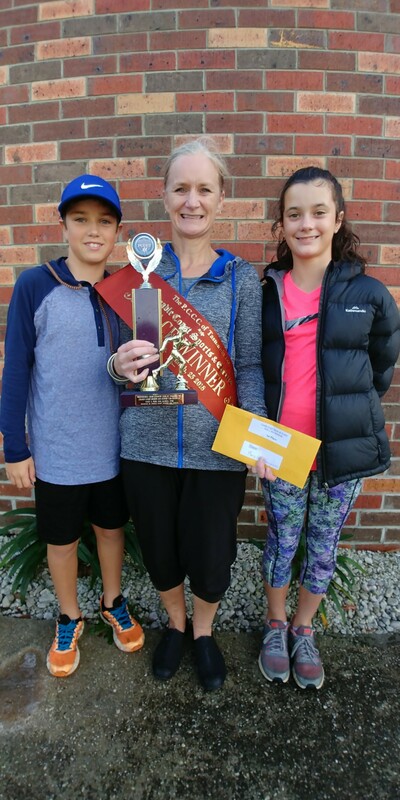 It was just a matter of time for Troughton as she was carrying on a family tradition with her husband Ken and two nephews, Ewan and Isaac, already winners with the Club. Her two children also compete in the nominated time events making cross-country running very much a family affair. Front markers dominated the race with the winner looking likely to be either Karina Mason or Sally Atkinson until both were passed by Troughton with about 200 m to run. In a great result for the women, fourth was Susan Moodie, while Ron Chequer was first man to finish with his fifth placing. Other promising results were turned in by Ann Horton and Owen Thomas while co-markers, Scott Murphy and Aaron Robertson ran together the whole way to finish just inside the ten. Fastest male and female were Brad Taylor and Natasha Mapley respectively. Lucy van Rooyen was the nominated time winner with Chloe Bates, Will van Rooyen and Dominic Troughton first three over the line.